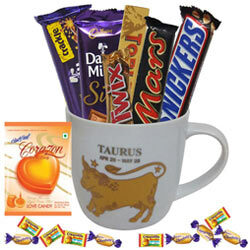 Splash liveliness into the lives of the people you care about by gifting this Attractive Mug with Taurus Sun Sign Print along with Tasty Chocolates Gift Collection that helps instantly rejuvenate the mood. This tempting Gift Collection delivers Heartbeat Corozon Chocolate, Cadbury Diary Milk Crackle, Cadbury Diary Milk Silk, Twix, Toblerone, Mars, Snickers, 5 pcs Chocolairs N 5 pcs Alpenliebe and a Mug with Taurus (April 20 – May 20) Sun Sign Print. Flowers Delivery Mehsana, Send sweets Rajkot, Wedding Cake Tellicherri, Diwali Mithai Manipal, Send Flowers and Gifts to Madanpalli, Online Shop Churu, Flower to Tumkur, New Year Flowers Tumkur , Fresh Fruits Ramgarh, Send Gift Rajkot, Dry Fruits to Tirunelveli, Birthday Delivery Bhavnagar, Sending to Karimnagar, Flower shop Howrah, Kolkata Online Cake Delivery.